Not just Catholic. The Eucharist is a blatantly Pagan magic ritual where a person, (priest, shaman or whatever) wearing fancy costume serves wine and bread to the participants (congregation, coven) whereupon it physically transforms into the blood and body of Christ. It is important to understand here that Catholics are required to believe (it is not optional, on pain of excommunication) that transubstantiation is real and not in any way figurative. This contrasts to the idea of transignification, popular with Baptists, where the presence of the body of Christ is merely symbolic. Anglicans/Episcopalians believe in a consubstantiation where the body and blood of Christ is physically present alongside the wine and bread. Which would still be voodoo by any standard. The Vatican has repeatedly asserted, even in recent years, that the transformation is real and actually happens. That is, when you eat the wafer it physically and entirely transforms into the flesh of another (dead) human. Which, apart from being ludicrous, is quite a disgusting belief. Catholics had always kooky rites. And why does Mohammed always play PS? Do we get to learn what he likes to play? What I don’t understand is the idealism of believing in something. What’s more, the more unlikely, the more noble one is for believing in it. Why do we have to live in a Sea Biscuit world? Does this mean we could clone jesus by making a catholic throw up after transubstantiation, taking a sample of the jesuswafer and inserting any genetic material into an embryonic stem cell? Yeti, unfortunately not. The vatican has elaborated on this by saying that the “Jesuswafer”, although actualy becoming his flesh (fat, bone, muscle or gristly bit is not specified), retains its empirical appearance as a wheaty snack. I suppose it is rather like the Flying Spaghetti Monster who, every time a Scientist takes a measurement, extends His Noodly Appendage and alters the data thereby deceiving him or her into thinking the Earth is over 4 billion years old when in reality it’s only a few thousand. Why this is so is a mystery, though it might be to prevent the priest from becoming sick on congealed blood while tippling the communion wine. Catholic literary interpretation is also quite interesting. Apparently when Jesus says that he will return within the lifetimes of those who knew him, he was talking about his friend Jim, who has miraculously managed to live tot he ripe old age of 2037. I’ve always wondered if sufficient DNA could be extracted from transubstantiated wine to enable a clone of Jesus to be produced. It would be an interesting test of Catholic beliefs and would, if successful, conclusively prove their case. This geometrical approach to philosophy is interesting and as you look at it, things in nature do, indeed, seem to conform to the patterns conveyed by the diagram. There are also modern equivalents, like Chaos Theory. However, as with most of these things, what started out as a philosophy get hijacked by priests and turned into a “belief system”, and before you know it, people are rattling bones, spinning prayer wheels, and trying to predict the future. 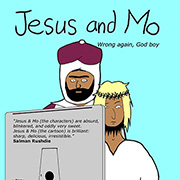 Why has the author made Mo smarter than Jesus? I mean this is not the impression one gets from reading the New Testament and Qur’an back to back. Saint Gasoline is probably referring to The Wandering Jew. Look it up on Wikipedia for some lulz. Their genetics are downright supernatural. At least the breakfast cereal Christ Crispies is divine with wine. 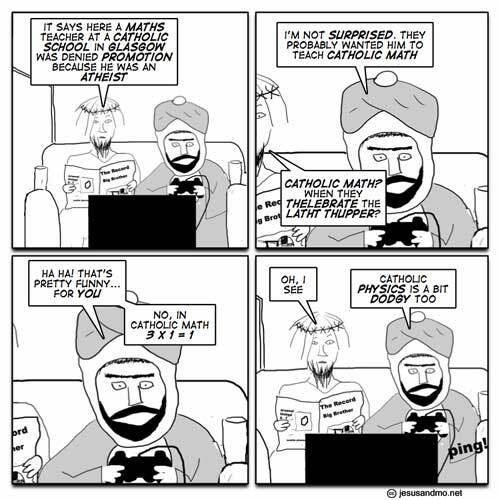 Don’t forget that Catholic math also includes Pi=3 (1 Kings 7:23)!